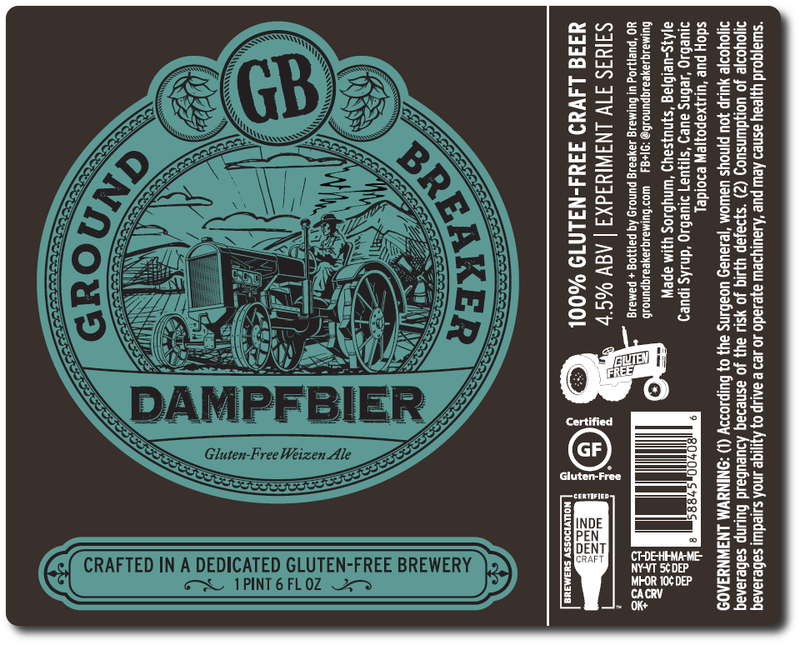 Ground Breaker Brewing, the first 100% dedicated gluten-free brewery in the United States, has debuted a new logo, new packaging, and a new line of merchandise. Ground Breaker opened in 2011, packaging exclusively into 22 ounce bottles. In 2015 the brewery introduced a 12 ounce can package for their flagship product, IPA No. 5, as well as the then-new Olallie, a blackberry and rosehip ale. Now the most medal winning gluten-free craft brewery has announced the move to 16 ounce cans for much of their line up. “We’re now packaging most of our year-round, seasonal and limited-release beers in a 16 ounce can package,” announced James Neumeister, founder and head of R&D at the brewery. IPA No. 5 and Olallie will continue to be offered in a 12 ounce package. Ground Breaker will also release future Experiment Ale and Roll-Up Door series beers in 16 ounce cans. Their new 16 ounce 4-packs will begin shipping to distribution partners on September 12. Merchandise featuring Ground Breaker’s new logo is now available for purchase in the Gastropub as well as on their website. Neumeister also announced that their award-winning dry-hopped pale ale would be rebranded as Inclusion. “We try to provide a craft beer experience that everyone can enjoy. Inclusion is a name that captures that spirit and conviction which we founded the brewery with. It's a great name for our first beer. It's also the beer we won our first GABF medal with." The first Experiment Ale Series beers to see the can switch will be fresh hop ales Epoch and Gayle. Epoch features Strata hops which debuted last year out of Oregon State University’s Aroma Hop Breeding Program and were commercialized with the help of Indie Hops, an Oregon-based hop merchant. Gayle features Crystal hops that are grown and harvested locally at Goschie Farms out of Silverton, Oregon.